It was the biggest internet craze for . . . days, at least? For the record, I could see the dress both ways and hear Yanni/Laurel both ways. The 2019 Mets remind me of these optical/audio illusions. In both of these illusions, what really mattered was perspective. That’s true of this year’s Mets as well. Lets look at the infield. At one glance, the Mets have aging veterans filling the bases. Todd Fraizer, Robinson Cano, and Jed Lowrie are all well into their 30’s. However, the infield also boasts the names of twenty-somthings: Pete Alonso, J.D. Davis, Amed Rosario and Dom Smith (who is making a strong argument to make the team in spring training.) Luis Guillorme, who is not expected to make the team, could also be added to this list, as he is having a strong ST as well. In the outfield, the likes of Yoenis Cespedes and Juan Legares (who is only 29, but knocking on the door of 30) haunt the Mets fans memories. But there is a huge youth movement in the outfield as well. Michael Conforto and Brandon Nimmo are huge fan favorites who will hopefully be mainstays in the outfield all year, and Juan Legares is having a very strong spring so far. Keon Broxton (28), Arismendy Alcantara (27) and Rhymer Liriano (27) provide much needed depth in the outfield. The catcher position received a much needed upgraded with 31 year old Wilson Ramos, who has been showing off his great swing this spring, he will be backed up by Travis d’Arnaud, although Devin Mesaraco has returned and the Mets certainly expect to see him on the field at some point this season. The Mets have a slew of young relievers who will fill the major league roster, as well as the minor league clubs. The youth movement on this squad is highlighted by 24-year-old closer Edwin Diaz, who will be set up by a familiar face named Jeurys Familia. Other than the inability to score runs, the Mets had two major problems last year – bullpen and depth at all the positions. These glaring problems have been addressed and they’ve been addressed with a healthy mix of veteran and young players all across the diamond. The question as to whether the Mets will score enough runs this year with this new lineup has yet to be answered. 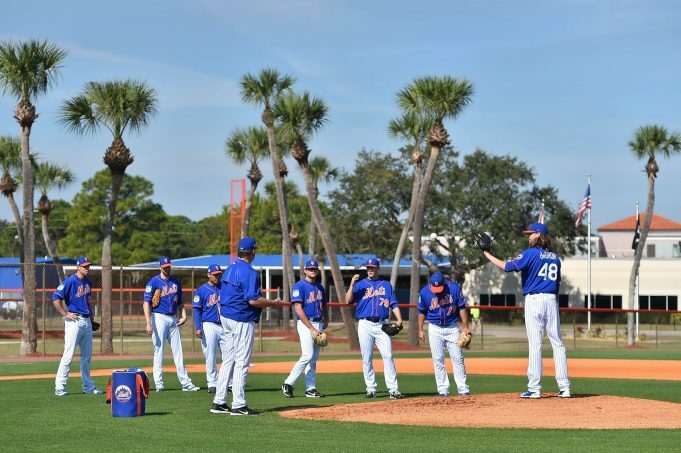 However, spring training should have Mets fans feeling pretty optimistic so far. The Mets are sprinkling hits all over the field and running the bases well. The younger players and veterans alike, on this team, have a lot of hustle and the early spring training games have been a lot of fun to watch. It’s all a matter of perspective. Just like the dress colors and the audio variations making you hear either “Yanni” or “Laurel”, the way you choose to see the 2019 Mets will depend largely on your perspective.